Human Rights Watch expressed its unequivocal view that suicide bombing is a crime against humanity. HRW also claims that the political elites, commanders, and those that organize, facilitate, and encourage these suicide attacks are likewise guilty of conduct that offends against prevailing norms of international criminal law. [Rome Statute of the International Criminal Court, Article 28(b), U.N.Doc. no. A/CONF. 183/9 (17 July, 1998), 37 I.L.M. 999]. In the words of Kenneth Roth, the Executive Director of Human Rights Watch, “[t]he people who carry out suicide bombings are not martyrs, they’re war criminals, and so are the people who help to plan such attacks.” – as such Adele Balasingham, a key member of the LTTE and head trainer of LTTE’s female cadres needs to stand trial for her crimes against humanity. India and Sri Lanka need to step up demands from the UK Government for action. LTTE has a habit of drawing attention. That attention has propelled the LTTE to be classified and viewed a level higher than other terrorist organizations and not many of them can pride in the ability to manufacture ready batches of girls with guns making themselves the fathers of modern-day suicide bombing willing to even export them. The new method of guerilla warfare was championed by the LTTE with their first suicide mission carried out in 1987 followed by several hundreds over the 3 decades of militant rule in a defacto area controlled with the help of warped western policy makers and the patronage of personages of the Church. LTTE accounts for 1/3 of all suicide attacks in the world. With the tiger leader treating himself as a demi-god it is no surprise that he would opt to instill the culture of sacrifice and martyrdom amongst his worshipping killer force. The female killer force was trained by none other than Adele Balasingham. LTTE never kept its killing or killer trainings secret. In 2002 TIME magazine was given a first hand look at a female LTTE tiger base. Hundreds of international INGOs present in the North all had close links to the LTTE and cannot deny that they were aware of LTTE’s recruitment of children. None cried foul or cared to even report to the UN or their Governments. A world that pays rigid attention to the words “human rights” – what stopped them from demanding why children were being manufactured into killers and told to commit suicide when caught? What have the international authorities mandated to protect children done except issue publications year in and year out while giving heartening speeches at annual conferences? What is stopping action against Adele Balasingham? Unlike other terrorist organizations the LTTE has found fundraising and influencing through funds the perfect means to silence critics. The LTTE diaspora have infiltrated the weaknesses of western politicians and decision makers using the strength of dollars and pounds gained illicitly by fooling foreign citizens through LTTE scams, human smuggling and now bogus refugee which is becoming a growing nuisance. Another word gaining fashionable prominence amongst international mouthpieces is “accountability” – accountability must rightfully start with those responsible for turning men, women and children into killers, kidnapping them from their parents, giving them training in arms, placing suicide vests on them, drugging them and brainwashing them into killing others and killing themselves – this is nothing any human being should feel proud of most of all Adele Balasingham, a nurse who is adopting euthanasia into terrorism and terrorists who she has trained. What critics need to first take note of is that a state military does not give orders to kill. Orders are given to only protect a nation’s sovereignty and its people who pose a threat to that sovereignty. Therefore it is very important to differentiate orders from state military and those that terrorists give. Whatever arguments given for the LTTE to exist or prevail, Adele Balasingham though spouse of the LTTE’s theoretician was a nurse by profession, a woman from the West taking pride in training young girls as young as 10years to kill. She proudly hands the only piece of jewelry these LTTE women are likely to ever wear – a tag on wrist, neck and waist for identification purposes. Their only hairstyle is two plaits and the only songs these girls would ever sing were hosanahs of Prabakaran. Jump forward to post-conflict these rehabilitated LTTE females are now seen on the catwalk modeling fashion whilst some have taken up hairdressing and beauty culture. It is not difficult to understand what LTTE and Adele has denied these young females. Adele was responsible for training, arming and tying a vile of cyanide around the necks of these innocent children. Orders were simple – if captured commit suicide by taking the cyanide. Terrorists giving such orders is excusable but a Western woman and a nurse at that is nothing compared to her parents being proud of their daughter training child soldiers. The UK authorities appear unconcerned about a war criminal living happily in Surrey after training thousands of young girls to their deaths. Of course, UK authorities have done little over the years to really clamp down on LTTE terrorism and one wonders why it would even allow its capital to be used as the international head quarters of the LTTE despite LTTE being banned in the UK. Why ban an entity as a terrorist organization if UK allows it to hold demonstrations, collect funds, influence its politicians, have them speak on LTTE stages….strange in deed. The tragedy is that Adele and the LTTE were responsible for turning probably talented individuals into killers. Many of whom have committed suicide on the orders given. None of these Black Tigers had any evidence of psychological disorder nor were they mentally imbalanced. Therefore the accountability for denying them their youth falls at the feet of LTTE and Adele. Contrary to the promoted norm of self-sacrifice is the reality that these women suffered from peer pressure, social stigma and fear – this is what made the suicide service possible. A third of the LTTE comprised women and it is believed 6000 of them died in combat and Adele Balasingham is diretly culpa able for their deaths and the parents of these young girls should take legal action. LTTE has killed over 250 Tamils half of which have been killed during ceasefires. It has recruited close to 5000 Tamil children most of whom are from low-income, low caste families which is why not too many Tamils abroad or those living in Sri Lanka’s south or Tamil politicians have cared to denounce recruitment of child combatants ever. The LTTE’s female military unit was headed by Adele Balasingham she christened them “Freedom Birds” – with no worries economically, socially, or politically, all these girls were focused towards was to kill. If these cadres had freedom why would there be any need to keep them under tight surveillance and accompany them even to the washroom and be severely punished for wanting to leave? The “freedom” LTTE has given Tamil women and in fact all of its cadres is by breaking their will to think, their ability analyze right from wrong and hypnotized them into killer machines. Once their natural thinking abilities have been broken it is easy for any group to have its followers function as zombies and remote controlled. The trust these young girls had placed in Adele was such that she was even refered to as “Aunty” – what aunty would lead children as young as 10 to their deaths? Where is the “freedom” when anyone attempting to leave faces summary execution? When there are enough of men who desert the army, there are hardly a handful of surviving LTTErs who have managed to successfully flee the LTTE! Given the argument that these females or males for that matter have self- sacrificed their lives to free Tamils from the Sinhalese – the all important question is why are there no suicide attempts after the demise of the LTTE especially since there is a big hue and cry over “militarization” of the North? This categorically proves that Tamil women were misled to their deaths by a program enticing them to kill and be killed spearheaded by the LTTE and facilitated by Adele Balasingham. It is clear that LTTE suicide killers never functioned in a vacuum and as Simone de Beauvoir aptly says suicide bombers are not born they are made. Proof of Adele Balasingham being a LTTE key member is given in the Norwegian Government website (SL) where she is a member of the LTTE delegation during the 2002 round the world peace talk sessions held in Thailand (3 sessions), Oslo, Germany and Japan. If suicide bombers are made its relevance to terrorism is not far behind. Given the inaction of global authorities towards eliminating terrorism it is for us to accept that terrorism is today nothing but an international political tool used to manipulate and influence Governments. In Asia, terrorism is being used to Balkanize Asia. With LTTE’s track record of assassinating 2 political leaders, the significance of Sri Lanka’s President telling India that Sri Lanka saved India by eliminating the LTTE is something that carries a weight of meaning. It is in this backdrop that India needs to shower more gratitude than it currently does and a good start may be is for India to insist from UK Government for action against Adele Balasingham for war crimes. Indian Premier does not appear to help any reconciliation though with his statements on giving dignity and self-respect to the Tamils for the ground realities only make Sri Lankans despise India more….who is writing these baseless speeches of Manmohan Singh one wonders! The calls for action against Adele Balasingham comes in the need to depart from thinking of terrorism or rather suicide terrorism along the lines of theoretical, ideological and political perspectives only. Why has little prominence been given to the criminal side to suicide terrorism? Suicide is being used as a strategy and form of protest cannot depart or hide from the fact that it is nothing more than mass murder, coercion towards death, destruction of life and intentional killing of others. Where can there be any legitimacy for such crimes under international or local laws? Is there a “just cause” in homicide? Terrorist organizations can call themselves what they like, they can have umpteen reasons to wage wars but they have no validity under international law or the law of the territory and representatives of international bodies must desist from misusing their office to promote their personal theories. All suicide bombings are crimes against humanity whatever ways Treaties describe them. No suicide bomber or its supervisor can be more important than the life or lives that they have intentionally planned and snuffed out. Suicide attacks fall into the category of murder with a mens rea – willingness to kill and willingness to die. What LTTE and Adele Balasingham and all others international and local promoting and excusing LTTE terror all these decades have left the people of the north and north eastern regions of Sri Lanka is a legacy of violence and killing with impunity and that culture of habit is now being tested minus LTTE. 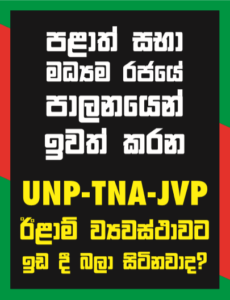 It is only a matter of time that the pieces of lies that made up the LTTE propaganda machinery duping people into giving money towards some “cause” for liberation from the Sinhalese would come to mean nothing other than filling one’s own coffers and living it good on foreign soil. Raj Rajaratnam finds himself in prison and others are likely to follow with time. With LTTE fighting force gone there is a scramble for the LTTE wealth and accusations are galore that Adele has part of those illgotten funds including millions of dollars from ransoms, scams and illegal businesses across the globe. Therefore, we want to know whether the mansion in Surrey is from those funds and why UK authorities does not wish to investigate? From the theatrics taking place it is our turn to ask for balcony tickets to watch LTTE representatives now scramble and scammer for supremacy fighting for leadership of the LTTE but the real catch is they are all fighting for that pot of wealth and care little for any Tamils in Sri Lanka. Greed will be the eventual downfall of the foreign LTTE. For foreign governments to be concerned it is when they know that their names are associated with secrets they desire to keep hidden. Adele’s safety is assured as long as she does not ruffle any State secrets. But that should not stop justice. She should not remain a free bird when she killed a lot of birds with freedom training to kill and commit suicide. Adele Balasingham’s war crimes cover 10,000 or more female LTTErs who had been trained to kill and to die when caught. It is time for justice for those crimes and parents of these dead girls can help build a case for which the UK Government must also take action without silently harboring a war criminal on UK soil.